Dundee moved off the bottom of the Premiership by beating Hearts 2-1 at Tynecastle with a fantastic, fighting performance that thrilled the travelling support. Genseric Kusunga put the Dark Blues ahead midway through the first half only for Olly Lee to score a freakish equaliser shortly before half time. Andrew Nelson grabbed a well deserved winner just after the hour and Hearts couldn’t find any way back into the game as Dundee defended superbly. Both clubs made two changes from the cup games at the weekend. The Dee brought in Andy Dales and Andrew Nelson for their first starts, with Roarie Deacon and Kenny Miller moving to the bench. Demetri Mitchell and Aidan Keena came in for Hearts, replacing Ben Garuccio and Steven Naismith. Dundee’s pace, energy and pressing from the start made life uncomfortable for Hearts. New boys Andrew Nelson and Andy Dales were both prominent and Nelson had the first shot on target. At the end of a fast run through the inside left channel his raking 20 yard shot brought a fine save by Colin Doyle who tipped the ball wide, only for the referee to award a goal kick. Nelson tried to slip Craig Curran through on goal after another good run, but Doyle won the race for the ball. It took Hearts 18 minutes to have a serious effort on goal when Arnaud Djoum tested Seny Dieng from 20 yards, but the Dee keeper pushed the ball wide. Dundee’s hard working pressing was forcing mistakes by Hearts’ defenders. Nelson did well to dispossess Shaughnessy, but shot wide. The Dark Blues deservedly took the lead after 23 minutes. Genseric KUSUNGA came forward to win the ball in midfield. As space opened up he kept going, played a one-two with Nelson and shot home from 12 yards, a composed move and finish that any midfielder would have been proud of. Dundee continued to look the better side and Andy Dales saw a swerving 20 yard shot dip over the crossbar. The Currans combined well when Jesse crossed and Craig’s header was well saved by Doyle. 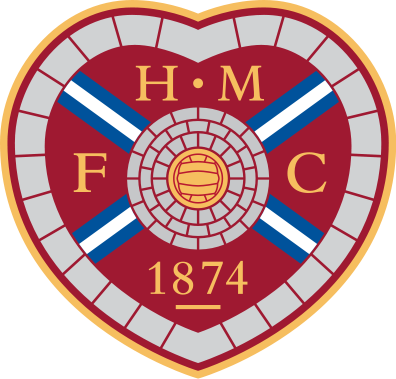 Hearts problems were illustrated when the ineffectual Vanacek was hooked after half an hour and the vastly experienced Steven MacLean came on. The Jam Tarts equaliser after 40 minutes was something of a fluke. Olly LEE took a free kick wide on the left and it flicked off the top of Jesse Curran’s head, looping horribly over Dieng and inside the far post. Hearts were lucky to be level at half time but Dundee didn’t let their heads go down and kept up their hard working game. Hearts had a good spell early in the second half, putting Dundee under pressure. A fast Hearts break ended with Dieng pushing Morrison’s fierce drive wide for a corner from which he had to save Christophe Berra’s header. The problems Dundee were still causing Hearts were illustrated again by a second Hearts substitution. John Souttar came on for Callum Morrison as the Jam Tarts switched to three centre backs to try and cope with the hard running pressing of the Dee strikers. The change did Hearts little good because Dundee grabbed the winner five minutes later. Nathan Ralph made space neatly and his pass for Craig Curran was missed by Conor Shaughnessy. Curran ran on and set up Andrew NELSON to smash the winner past Doyle from near the penalty spot. That was Nelson’s last touch and he came off for Callum Moore to make his debut, playing in midfield as Jim McIntyre sought to prevent Hearts controlling the middle of the park. The goal was a highly effective way of stopping Hearts building up impetus and Dundee kept the Jam Tarts fairly quiet for the next 20 minutes. Dieng had to grab the ball smartly from MacLean’s feet as Hearts worked a smart free kick but Dundee were mainly successful in keeping Hearts at bay. In the last 10 minutes Hearts inevitably put Dundee under some fierce pressure, but they struggled to set up good chances. 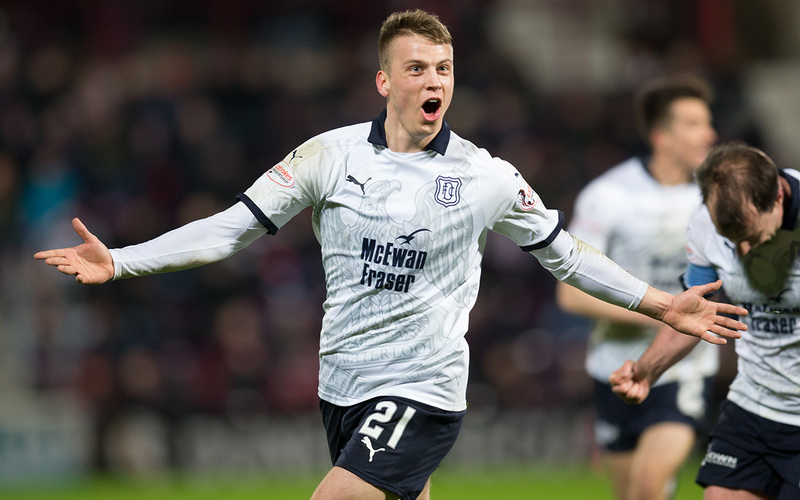 The Dark Blues defence stood up to Hearts wonderfully. Centre backs Genseric Kusunga and Ryan Inniss won countless headers, almost always powering their way past a maroon shirt to make a clearing header. After 85 minutes Dundee had a decent opportunity to make the points safe. Good work by Jesse Curran on the right gave substitute Benjamin Källman a chance, but his shot was blocked. Kenny Miller was also on the park now, and his follow up was saved by Doyle. There were some worrying moments when Hearts forced the ball into the penalty area, producing some scrambles, but the only really close thing was a volley by Aidan Keena from 18 yards that flew inches wide. When the final whistle sounded the noisy Dark Blue supporters rose to applaud the fighting Dees. This was not just a hugely important win, it was also an excellent performance, right the way through the team. The players won their individual battles all over the park and played some good football too, making great use of the wide players Jesse Curran and Andy Dales. Tonight’s display was by some distance the Dark Blues’ best performance of the season and the fans enjoyed it hugely. Unused subs: Zlamal (gk), Bozanic, Cochrane, Godinho. Booked: Vanacek (foul on Kusunga). Unused subs: Parish (gk), Deacon, Jefferies, Lambert. Goals: Kusunga (23), Nelson (61). Booked: Kerr (foul on Mitchell), Nelson (foul on Berra), Craig Curran (foul on Shaughnessy). Attendance: 15,518 (247 happy Dees).